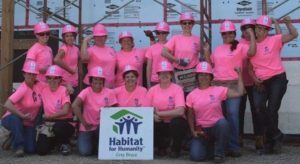 Do you have past experience with Habitat for Humanity? Trained in First Aid? Please provide date. Trained in CPR? Please provide date. Certified or Licensed in a Trade? Please specify. Please indicate if you have experience in any of the following areas. Waiver Release and Waiver of Liability, Assumption of Risk and Indemnity Agreement (the “Release”) The “Release” is in favour of Habitat for Humanity Grey Bruce (“HFHGB”), an Ontario non-profit corporation and its directors, officers, employees, and agents. The Volunteer desires to participate in the Habitat for Humanity Grey Bruce Build Program and related activities which may include but not limited to the following: * on-site building *off-site build related activity *Travel to / from site or lodging *fund raising activities *activities incidental to build program HFHGB retains the right to limit or prohibit participation of the Volunteer in the activities of the HFHGB Build Program if HFHGB determines that such participation will not be in the best interest of HFHGB or the Volunteer. The Volunteer understands that he or she will be responsible for the payment of any expenses incurred as a result of application of this section. The Volunteer does hereby freely, voluntarily, and without duress execute this release under the following terms: WAIVER AND RELEASE: The Volunteer does hereby release and forever discharge and hold harmless HFHGB, its directors, officers, employees, and agents and their successors and assigns from any and all liability, claims, and demands of whatever kind or nature, either in law or in equity, which arise or may hereafter arise from the Volunteer’s participation in the HFHGB Build Program. INDEMNITY: The Volunteer further agrees to indemnity and save harmless HFHGB for any claim or causes of action arising by reason of the Volunteer’s participation in the HFHGB Build Program. The Volunteer understands that this Release discharges HFHGB from any liability or claim that the Volunteer may have against HFHGB or with respect to any bodily injury, illness, death, property damage or any other claim that may result from the Volunteer’s participation in the HFHGB Build Program. The Volunteer also understands that Habitat does not assume any responsibility for or obligation to provide financial or other assistance to the Volunteer, including but not limited to medical, health or disability insurance. The Volunteer understands that HFHGB does not carry or maintain health, medical or disability insurance coverage for any Volunteer. Such coverage should be the sole responsibility of the Volunteer. MEDICAL TREATMENT: The Volunteer does hereby release and forever discharge HFHGB from any claim whatsoever which arises or may hereafter arise on account of any first aid, treatment or service rendered in connection with the Volunteer’s participation in the HFHGB Build Program. PHOTOGRAPHIC RELEASES: The Volunteer does hereby grant and convey unto Habitat all right, title and interest in any and all photographic images and video or audio recordings made by Habitat during the HFHGB Build Program, including, but not limited to any royalties, proceeds or other benefits derived from such photographs or recordings. ASSUMPTION OF RISK: The Volunteer understands that the HFHGB Build Program may include activities that may be hazardous to the Volunteer and that the food, accommodations, and medical facilities may be donated to HFHGB and beyond the control of HFHGB. INDEPENDENT LEGAL ADVICE: The Volunteer acknowledges that he or she has the right to obtain independent legal advice prior to the execution of this Release and has either obtained same or chosen to waive such independent legal advice. OTHER: This Release shall be governed by and interpreted in accordance with the laws of the country of Canada and the province of Ontario within which it is executed. The Volunteer agrees that in the event that any clause or provision of this Release shall be held to be invalid by any court of competent jurisdiction, the invalidity of such clause or provision shall not otherwise affect the remaining provision of this Release which shall continue to be enforceable. IN WITNESS WHEREOF, BY SUBMITTING THIS FORM, the Volunteer has executed this Release as of the day of submission. Agreement BY SUBMITTING THIS FORM I ACKNOWLEDGE THAT I HAVE READ THE EMBEDDED WAIVER AND THAT I AGREE TO ALL OF ITS CONDITIONS.